Now that Alex Rodriguez has reached 3,000 hits, who might be the next main to join that exclusive club? Ichiro Suzuki, Adrian Beltre, Miguel Cabrera and Albert Pujols all have an excellent chance to get there soon. On Friday night, Yankees slugger Alex Rodriguez became the first player since longtime teammate Derek Jeter in 2011 to reach the 3,000-hit milestone and just the second since Astros legend Craig Biggio did so eight years ago. The wait for the next player to reach the mark, however, won’t be nearly as long. In fact, in the next four years, we could see as many as four players reach 3,000 hits, with the first coming as early as next season. Suzuki looked like he would fall short prior to this season, but he has gotten more playing time than expected as the Marlins' fourth outfielder and is currently on pace for 96 hits this season, which would put him just 60 short of 3,000. If he gets that close, it would be shocking if no team offered him a contract to chase 3,000 next season. Ichiro may not get quite that close, however. Of his 42 hits this season, 19 came in the 16 games he started in leftfield while Christian Yelich was on the disabled list. 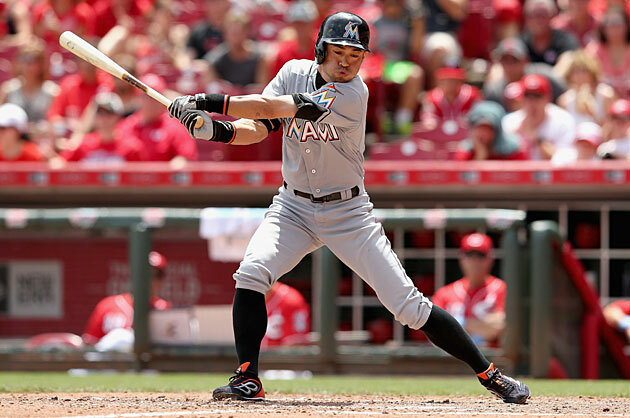 Using his hit pace in Miami's other 55 games this season, Suzuki projects to get just 38 more hits this season. That would put him at 80 on the season and 2,924 for his career, meaning he would need 76 next year to get to 3,000. Given his respectable showing at the plate (.288/.340/.336), it's likely a team will give him a chance to get there (the Marlins are already considering it). Suzuki, who turns 42 in October, is actually even closer to a more significant milestone that could give him ample motivation to keep playing. Between Major League Baseball and Nippon Professional Baseball, he has 4,164 hits, leaving him just 92 away from tying Pete Rose’s all-time mark of 4,256. If he gets those additional 38 this season, he’d be 54 away from Rose at the end of the year. As for the next three men on above list, all are near-locks to get to 3,000. To assess their chances, I turned to a formula devised by Bill James in 1981 and dubbed “The Favorite Toy.” (Those who don’t care about the math can skip to the next paragraph.) Favorite Toy uses a player’s performance in a given category over the last three seasons to determine his “established level” of production, weighing the more recent seasons more heavily (giving his most recent season three times the weight of his third-most recent season and his second-most-recent season two times the weight). Then, rather than stepping that level of production down to simulate a decline, it takes a pessimistic view of the number of years remaining in a player’s career, based on current age, to achieve the same effect more simply. That is done by subtracting 60% of the player’s current age from 24 to get his projected number of remaining seasons. For example, the 35-year-old Pujols, who is under contract for six more seasons, is projected to play just three more years, but all at his established level from the last three years. A 27-year-old player is projected to play just 7.8 more seasons, giving him a career three years shorter than Pujols’, but is projected to collect hits at his current established level in each of those remaining seasons. Favorite Toy comes with a caveat that no player can have higher than a 97% chance of achieving a milestone, which is why Cabrera tops out there. He is currently on pace for 197 hits this season and hasn’t had fewer than 191 in a season since 2010. If he gets those 197 hits and finishes this season with the 2,383 projected above, he would need to average just 155 over the next four seasons to reach 3,000 by the age of 36. Barring injury, he’s a lock for 3,000 and should get there comfortably in the '19 season. Thanks to his contract, which runs through 2021 and of which Favorite Toy is obviously unaware, Pujols is every bit as much of a certainty. He is on pace for 160 hits this season and collected 172 or 173 in three of the four seasons prior to this. Assuming he reaches his projection of 2,679 hits by the end of this season, Pujols would need to average just 54 per season in the six years remaining on his contract to reach 3,000. At his current pace, he looks to reach the milestone at the end of '17 or early in '18. As for Beltre, his current injury complicates matters. He has been out since the end of May due to a sprained left thumb and as of Friday could still not grip a bat, never mind swing one. His 2015 projection is based on his hit rate on the season as a whole, so he could miss another month and stay on the pace projected above, but right now the 70 hits he is projected to add to his career total this season are extremely speculative. Beltre will be 37 next April and in the final year of his contract with Joey Gallo jockeying for his position in Texas, and he has a history of hitting for low averages in non-hitters parks (he has hit .312 over the last six seasons, but hit just .266 in his five prime seasons with the Mariners). All of that said, if Beltre gets even 50 more hits this season, he’ll need fewer than 300 to get to 3,000, a total he should be able to obtain by 2018, his age-39 season, at the latest. Indeed, it will be interesting to see whether Beltre or Pujols gets to 3,000 first. If he makes a full recovery from his thumb injury, Beltre should win that race, but if the injury eats of a significant portion of the remainder of his season or has a lingering effect on his production after his return, Pujols might sneak past him. With Beltre, Pujols and Cabrera all near-locks to get to 3,000, the more interesting question might be how high on the all-time list they are going to get. The Favorite Toy helps out there, as well. It projects Beltre to finish with 3,099 hits, which would place him between Dave Winfield (3,110) and Craig Biggio (3,060). Pujols projects to finish with 3,141, which would tie the late Tony Gwynn. Cabrera, meanwhile, is projected to reach 3,316 hits, which would place him just shy of Paul Molitor’s 10th-place total of 3,319 (using Baseball-Reference’s more inclusive leader list, which has Cap Anson at 3,435). That makes Cabrera cracking the top 10 all-time in hits a very real possibility. Robinson Cano's bad 2015 has hurt his chances at reaching 3,000 hits. After those three, the only player who is more than half way to 3,000 hits to have any kind of realistic chance of getting there is the Mariners' Robinson Cano, who is six months older than Cabrera and has 1,901 hits, though he is in the midst of a lousy age-32 season. Cano’s poor showing this year (.243 average for a career .307 hitter) has significantly reduced his chances of reaching 3,000 per the Favorite Toy. Cano averaged 190 hits per year over the last four season, and if he managed to scratch out that many again this year, he’d have a 43% chance of reaching 3,000. However, Cano is currently on pace for just 150 this season, which would leave him shy of 2,000 heading into his age-33 season. It would also significantly reduce his “established level” in the Favorite Toy given that the formula weighs a player’s most recent season most heavily. Using that 150-hit projection based on his actual production this season, Cano’s chance of reaching 3,000 hits drops to 30%. 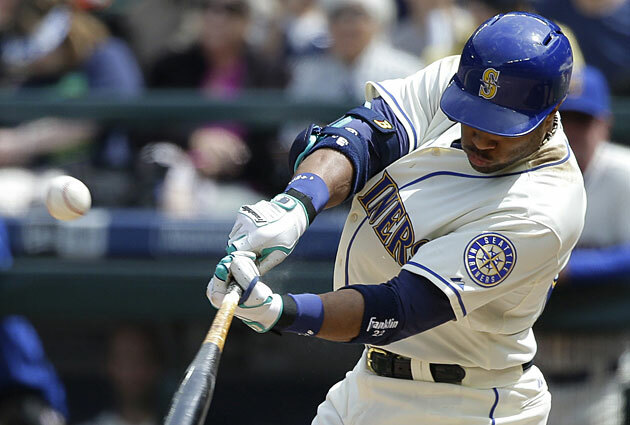 His tough home ballpark and the tendency for second basemen to suffer early declines make Cano a long shot at best. There’s actually an active player with fewer hits than Cano that the Favorite Toy thinks has a better shot at reaching the milestone. The Angels' Mike Trout has only 651 career hits, but he’s also just 23, and his current pace (183 this season) has an established level of 180 hits per season. It’s obviously a bit silly to project a player to accumulate 461% of his current career hit total, but I couldn’t resist the temptation to apply the Favorite Toy to some of the game’s best players. The following chart are the current 20-somethings most likely to reach 3,000 per the Toy. There are a number of things to consider on that list, primarily the impact of injuries on various players’ projections. Giancarlo Stanton, for example, is hurt by the time he missed in 2013. If you adjust his established level to 155 hits per season, his chance increases to 13%. If you adjust Bryce Harper’s up to 160 per season, his increases to 20%. Eric Hosmer may be a surprising inclusion to some, but he’s on pace for 182 hits this season and had 188 in 2013. If you adjust his established level to 180, his chance jumps up to 22%. Perhaps most compelling, however, is Manny Machado, who is just three months older than Harper. Machado, like Suzuki, is able to accumulate so many hits in part because he walks so infrequently. The lack of walks hurts his on-base percentage and thus his overall value, but it also means he’s swinging more and collecting more hits. He picked up 189 two years ago, and this year, he’s on pace for 190. If we set his established level at 190, he actually surpasses Trout with a 32.7% chance of reaching 3,000 hits. Not included on the above chart is 24-year-old Yasiel Puig, who has 318 career hits through Sunday’s action and whose time missed due to injury early this season made it too difficult to estimate a realistic established level in just his third major league season. The same could be said of Arenado, another third-year player who missed significant time due to injury last year; he's included above because, unlike Puig, he had a non-zero chance of 3,000 per the Toy. Also, since the above chart includes Harper and Machado, it’s worth mentioning that there are two other 22-year-olds in the majors right now who have more than 100 career hits, those being the Red Sox' Xander Bogaerts (210) and Mookie Betts (129). Getting an early start to one’s major league career is a crucial aspect of reaching a milestone such as 3,000 hits. Of the 29 men to get there, 22 made their major league debuts in their age-21 season or earlier; just three debuted at the age of 23 or later (Pirates greats Honus Wagner and Paul Waner, both 23, and Wade Boggs, 24). Of the 21 active players mentioned above, only Suzuki—a unique case if there ever were one—debuted in the majors after the age of 22 (he was 27 when he joined the Mariners in 2001). Of the other 20, all but McCutchen debuted in or before their age-21 season. I’m not predicting that any of those players is going to reach 3,000 hits, though it’s tempting to do so with Correa, the youngest and arguably best of that group. Still, their early debuts, like those of Rodriguez (age 18), Beltre (19), Cabrera (20) and Pujols (21), give them a chance they might not have had if they spent a couple more seasons in the minors.